PITTSBURGH—BirdBrain Technologies, a Pittsburgh startup that commercializes projects developed by Carnegie Mellon University's CREATE Lab, will loan 1,000 of its Finch robots to school districts or educational groups during Computer Science Education Week (CSEdWeek), Dec. 8-14. "We want to support Computer Science Education Week's Hour of Code initiative, which seeks to demystify computer code with a one-hour introductory activity for 10 million students," said Tom Lauwers, a Ph.D. graduate of the Robotics Institute and the founder of BirdBrain. "Finch was developed at the Robotics Institute specifically to make computer programming more compelling for novices, so we want to make the robots available to as many students as possible that week." BirdBrain will loan the robots to up to 20 school districts or educational organizations. The deadline for applications is Oct. 4. Further information is available on the company website, http://www.finchrobot.com/one-thousand-robots. 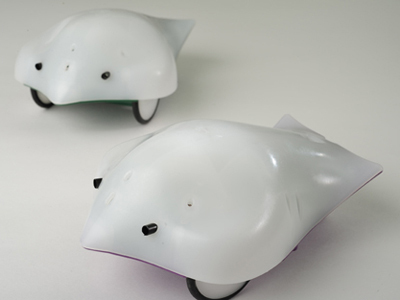 The low-cost, tabletop robot with bird-like features is based on four years of educational research by the CREATE Lab that was sponsored by the National Science Foundation. BirdBrain began marketing the robot in 2011. BirdBrain will cover the costs of shipping and will provide a detailed, one-hour exercise for students to program Finch. The company will ship five robots to each participating organization early in November to allow teachers time to prepare for CSEdWeek. The remainder of the robots will be shipped to arrive by Dec. 4. CSEdWeek is an annual program dedicated to showing K-12 students the importance of computer science education. Organized each year by the Computing in the Core coalition and Code.org, CSEdWeek is held in recognition of the Dec. 9, 1906, birthday of computing pioneer Admiral Grace Murray Hopper. The low-cost, tabletop robot with bird-like features (pictured above) is based on four years of educational research by the CREATE Lab that was sponsored by the National Science Foundation. BirdBrain began marketing the robot in 2011.